[Tilburg] “The /conditionings/ associated with a particular class of /conditions/ of existence produce HABITUS, system of durable, transposable /dispositions/, /structured structures/ /predisposed/ to function as /structuring structures/, that is, as principles……. 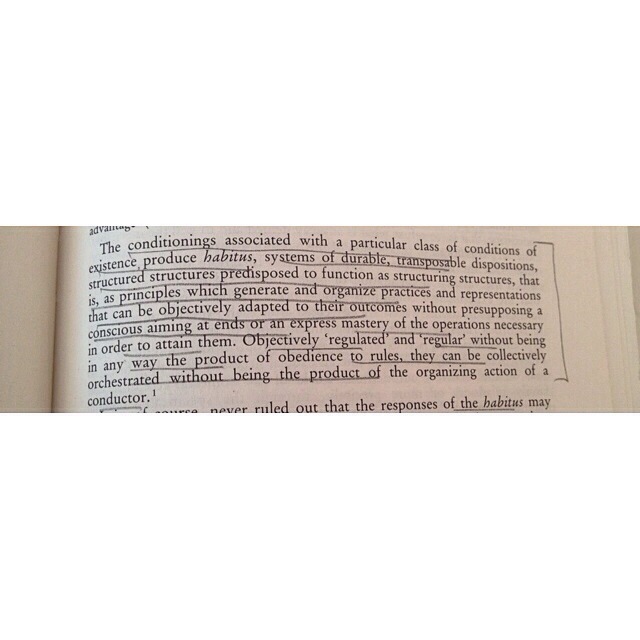 Objectively /regulated/ and /regular/ without being in any way the product of /obedience/ to /rules/……” This is how to define a habitus. Words in between slashes are either synonyms or homographs or whatever, in which the combination of the words, hmm, doesn’t necessarily help us out to understand what Bourdieu would like to tell us. Correct me if I’m wrong, it’s just the same way as trying to describe an orange to a born blind guy by saying :”you know, it’s kind of fruit, but an orange is simply neither an apple nor a watermelon.” It helps guys, it helps..